There is little more satisfying than bringing in a big cash win. Click here to play! If you agree then you'll definitely want to have a few spins on this classic three reel game. If lady luck is on your side then you'll certainly be bringing in plenty of Big Cash Wins! The ultimate prize in this game is 2000 coins. In order to get that prize you'll need to spin three Big Cash Win symbols across the single pay line in this game. But if you don't get that on the first spin, don't worry! There are plenty of other symbols to help you bring in the big bucks. Spin three golden sevens across the pay line and you'll get up to 400 coins. Three cherries will get you 300 coins. Triple, double and single BARS also pay out with the first bringing in up to 80 coins, the second bringing in up to 60 and the last getting up to 40. 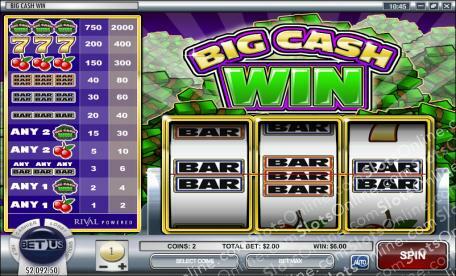 There are also a few other combinations that will help you in your quest for big cash wins. Be sure to bet the maximum coins to activate the highest pay table, and play a few rounds in this game for a chance to bring in your share of Big Cash Wins!